This week is all about expanding on our current Routine. Since Stat Trackers are all the rage, this week we will use one of those to track steps for 3 days. 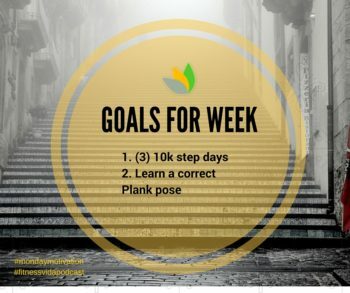 This is a great way to see if you are getting the step goal for each day. Also this week we are going to try to learn how to do a correct Plank Pose. This is one of the most essential moves in a fitness routine and should ALWAYS be done with correct form. If you have never done a plank before, you can watch a great video below on proper form and technique. If you are already planking, try adding a challenge to your plank like increasing hold time, lifting one arm or leg at a time.